For the gambling degenerates, here are my Week 9 NFL picks. To note, the helmets indicate who I think will win the game, not cover the spread. At the end of the picks, I'll note a few teams that I like based on the spread. Bills (-3) at Jets: The Jets have been way better than I expected heading into this season, but (A), the Bills are healthy, (B), they're better, and (C), as usual, this is a Thursday night game I have zero interest in watching. Falcons at Panthers (-1): In the Falcons' two games against the Panthers last season, they scored 81 points and racked up 979 yards. The Panthers' defense has been good this season, but it's hard to pass up the Falcons as one-point dogs in this matchup. Colts at Texans (-12.5): This is going to be an extremely popular pick for people still alive in their survivor pools. Bengals at Jaguars (-4.5): The Bengals almost got second- and third-round picks from the Browns for freaking A.J. McCarron, lol. I suppose McCarron is a top 20 quarterback? Sorry. The Browns don't even play this week and I can't help but make fun of them. Anyway, Jaguars. Buccaneers at Saints (-7): In case you missed our NFC Hierarchy/Obituary, we killed off the Bucs this week. 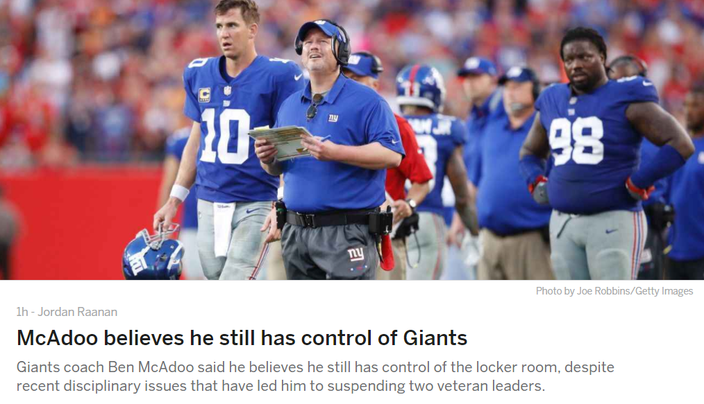 Rams (-3.5) at Giants: I love the accompanying picture that goes along with this headline about Ben McAdoo on ESPN. Broncos at Eagles (-8): The Broncos have a good defense, and so do the Eagles. The Broncos have an awful offense, but the Eagles have a good offense. And thus concludes my extraordinarily remedial analysis of this matchup. Ravens at Titans (-5.5): Both of these inconsistent teams look good one week, and woeful the next. I wouldn't touch it, but for my purposes here I'll go with the home team. Cardinals (-2) at 49ers: It's Drew Stanton vs. C.J. Beathard! Wooooooo! Meanwhile, Seattle's defense will be ready to bounce back from a bad performance in a win against the Texans last week. The only team they have beaten that has a decent offense is the Redskins, who were missing four of five offensive line starters, and still gave Dallas a game. In their next three games, the Cowboys will face the No. 3 ranked offense (Chiefs), the No. 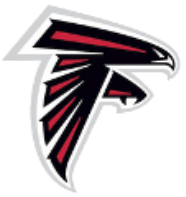 5 ranked offense (Falcons), and the No. 6 ranked offense (Eagles). This is the worst possible time to lose your chain-moving running back who keeps opposing offenses off the field. Raiders (-3) at Dolphins: The Raiders are overrated and Adam Gase may be Chip Kelly 2.0. Anyway, I'll take the team with a good quarterback. Lions (-2.5) at Packers: The Lions simply can't protect their quarterback. BYE: Bears, Browns, Vikings, Patriots, Steelers, Chargers. • Picks against the spread: Falcons (-1), Seahawks (-7), Chiefs (Pick 'em).